Artist's conception of Proxima Centauri b as a rocky-like exoplanet, with Proxima Centauri and the Alpha Centauri binary system in the background. The actual appearance of the planet is unknown. Proxima Centauri b (also called Proxima b   or Alpha Centauri Cb) is an exoplanet orbiting in the habitable zone of the red dwarf star Proxima Centauri, which is the closest star to the Sun and part of a triple star system. It is located about 4.2 light-years (1.3 parsecs, 40 trillion km, or 25 trillion miles) from Earth in the constellation of Centaurus, making it the closest known exoplanet to the Solar System. 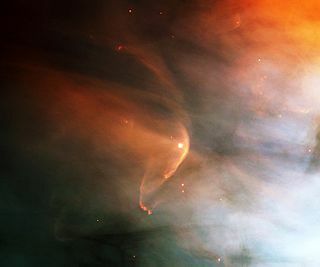 A stellar wind is a flow of gas ejected from the upper atmosphere of a star. It is distinguished from the bipolar outflows characteristic of young stars by being less collimated, although stellar winds are not generally spherically symmetric. In astronomy, minimum mass is the lower-bound calculated mass of observed objects such as planets, stars and binary systems, nebulae, and black holes. Proxima Centauri, or Alpha Centauri C, is a red dwarf, a small low-mass star, about 4.244 light-years (1.301 pc) from the Sun in the constellation of Centaurus. It was discovered in 1915 by Robert Innes and is the nearest-known star to the Sun. With a quiescent apparent magnitude of 11.13, it is too faint to be seen with the naked eye. Proxima Centauri forms a third component of the Alpha Centauri system, currently with a separation of about 12,950 AU (1.94 trillion km) and an orbital period of 550,000 years. At present Proxima is 2.18° to the southwest of Alpha Centauri. Even though Proxima Centauri is the closest star to the Sun, it is not visible to the unaided eye from Earth because of its low luminosity (average apparent magnitude of 11.13  ). Proxima Centauri is a flare star. This means that it undergoes occasional dramatic increases in brightness and high-energy emissions because of magnetic activity that would create large solar storms. On 18 March 2016 a superflare was observed with an energy of 10^33.5 erg. The surface irradiation was estimated to be 100 times what is required to kill even UV-hardy microorganisms. Based on the rate of observed flares, total ozone depletion of an Earth-like atmosphere would occur within several hundred thousand years. The exoplanet is orbiting within the habitable zone of Proxima Centauri, the region where, with the correct planetary conditions and atmospheric properties, liquid water may exist on the surface of the planet. The host star, with about an eighth of the mass of the Sun, has a habitable zone between ∼0.0423–0.0816 AU. In October 2016, researchers at France's CNRS research institute stated that there is a considerable chance of the planet harboring surface oceans and having a thin atmosphere. However, unless the planet transits in front of its star from the perspective of Earth, it is difficult to test these hypotheses. Viewed from near the Alpha Centauri system, the sky would appear much as it does for an observer on Earth, except that Centaurus would be missing its brightest star. The Sun would be a yellow star of an apparent magnitude of +0.5 in eastern Cassiopeia, at the antipodal point of Alpha Centauri's current right ascension and declination, at 02h 39m 35s+60° 50′ (2000). This place is close to the 3.4-magnitude star ε Cassiopeiae. Because of the placement of the Sun, an interstellar or alien observer would find the \/\/ of Cassiopeia had become a /\/\/ shape [note 3] nearly in front of the Heart Nebula in Cassiopeia. Sirius lies less than a degree from Betelgeuse in the otherwise unmodified Orion and with a magnitude of −1.2 is a little fainter than from Earth but still the brightest star in the Alpha Centauri sky. Procyon is also displaced into the middle of Gemini, outshining Pollux, whereas both Vega and Altair are shifted northwestward relative to Deneb (which barely moves, due to its great distance), giving the Summer Triangle a more equilateral appearance. A team of scientists think they can image Proxima Centauri b and probe the planet's atmosphere for signs of oxygen, water vapor, and methane, combining ESPRESSO and SPHERE on the VLT. The James Webb Space Telescope may be able to characterize the atmosphere of Proxima Centauri b,  but there is no conclusive evidence for transits combining MOST and HATSouth photometry, giving it less than a 1 percent chance of being a transiting planet. Future telescopes (the Extremely Large Telescope, the Giant Magellan Telescope, and the Thirty Meter Telescope) could have the capability to characterize Proxima Centauri b.
Velocity of Proxima Centauri towards and away from the Earth as measured with the HARPS spectrograph during the first three months of 2016. The red symbols with black error bars represent data points, and the blue curve is a fit of the data. The amplitude and period of the motion were used to estimate the planet's minimum mass. An angular size comparison of how Proxima will appear in the sky seen from Proxima b, compared with how the Sun appears in our sky on Earth. Proxima is much smaller than the Sun, but Proxima b is very close to its star. The relative sizes of a number of objects, including the three stars of the Alpha Centauri triple system and some other stars for which the angular sizes have also been measured. The Sun and Jupiter are also shown for comparison. This chart shows the large southern constellation of Centaurus (the Centaur) and shows most of the stars visible with the naked eye on a clear dark night. The location of the closest star to the Solar System, Proxima Centauri, is marked with a red circle. Proxima Centauri is too faint to see with the unaided eye but can be found using a small telescope. 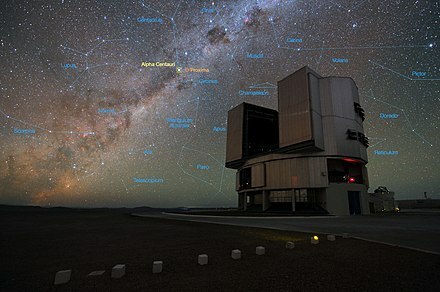 This picture combines a view of the southern skies over the ESO 3.6-metre telescope at the La Silla Observatory in Chile with images of the stars Proxima Centauri (lower-right) and the double star Alpha Centauri AB (lower-left) from the NASA/ESA Hubble Space Telescope. Proxima Centauri is the closest star to the Solar System and is orbited by the planet Proxima b. A numerical simulation of possible surface temperatures on Proxima b performed with the Laboratoire de Météorologie Dynamique's Planetary Global Climate Model. Here it is hypothesised that the planet possesses an Earth-like atmosphere and that it is covered by an ocean (the dashed line is the frontier between the liquid and icy oceanic surface). Two models were produced for the planet's rotation. Here the planet is in a so-called 3:2 resonance (a natural frequency for the orbit), and is seen as a distant observer would do during one full orbit. 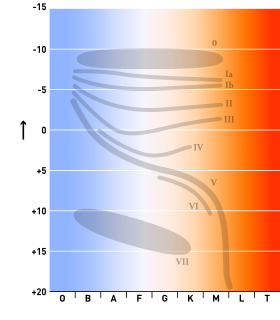 A numerical simulation of possible surface temperatures. Here it is hypothesised that the planet possesses an Earth-like atmosphere and that it is covered by an ocean (the dashed line is the frontier between the liquid and icy oceanic surface). Here the planet is in synchronous rotation (like the Moon around the Earth), and is seen as a distant observer would do during one full orbit. ↑ Pale Red Dot is a reference to Pale Blue Dot—a distant photo of Earth taken by Voyager 1. An exoplanet is a planet located outside the Solar System. The first evidence of an exoplanet was noted as early as 1917, but was not recognized as such. However, the first scientific detection of an exoplanet began in 1988. Shortly afterwards, the first confirmed detection came in 1992, with the discovery of several terrestrial-mass planets orbiting the pulsar PSR B1257+12. The first confirmation of an exoplanet orbiting a main-sequence star was made in 1995, when a giant planet was found in a four-day orbit around the nearby star 51 Pegasi. Some exoplanets have been imaged directly by telescopes, but the vast majority have been detected through indirect methods, such as the transit method and the radial-velocity method. As of 1 April 2019, there are 4,023 confirmed planets in 3,005 systems, with 656 systems having more than one planet. This is a list of the most notable discoveries. HD 85512 b is an exoplanet orbiting HD 85512, a K-type main-sequence star approximately 36 light-years from Earth in the constellation of Vela. The habitability of red dwarf systems is determined by a large number of factors from a variety of sources. Although the low stellar flux, high probability of tidal locking, small circumstellar habitable zones, and high stellar variation experienced by planets of red dwarf stars are impediments to their planetary habitability, the ubiquity and longevity of red dwarfs are positive factors. Determining how the interactions between these factors affect habitability may help to reveal the frequency of extraterrestrial life and intelligence. Gliese 832 c is an extrasolar planet located approximately 16 light-years away in the constellation of Grus, orbiting the star Gliese 832, a red dwarf. It is in its star's habitable zone and a big reason for its high rating is it receives the same amount of solar flux as the earth in the habitable exoplanets catalog. 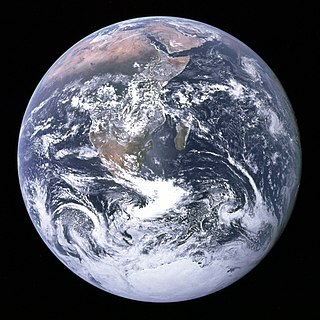 The planet has a mass of 5.2 Earth's masses and an estimated radius of >1.5 Earth radii. Wolf 1061c or WL 1061c is an exoplanet orbiting within the habitable zone of the red dwarf star Wolf 1061 in the constellation Ophiuchus, about 13.8 light years from Earth, making it the fifth closest known, potentially habitable, and confirmed exoplanet to Earth, yielding interest from astronomers. It is the second planet in order from its host star in a triple planetary system, and has an orbital period of 17.9 days. Wolf 1061c is classified as a super-Earth exoplanet as its estimated radius is greater than 1.5 R⊕. TRAPPIST-1, also designated 2MASS J23062928-0502285, is an ultra-cool red dwarf star that is slightly larger, but much more massive, than the planet Jupiter; it is located 39.6 light-years (12.1 pc) from the Sun in the constellation Aquarius. Seven temperate terrestrial planets have been detected orbiting the star, a larger number than detected in any other planetary system. A study released in May 2017 suggests that the stability of the system is not particularly surprising if one considers how the planets migrated to their present orbits through a protoplanetary disk. Ross 128 b is a confirmed Earth-sized exoplanet, likely rocky, orbiting within the inner habitable zone of the red dwarf Ross 128, at a distance of about 11 light-years from Earth. The exoplanet was found using a decade's worth of radial velocity data using the European Southern Observatory's HARPS spectrograph at the La Silla Observatory in Chile. Ross 128 b is the nearest exoplanet around a quiet red dwarf, and is considered one of the best candidates for habitability. The planet is only 35% more massive than Earth, receives only 38% more sunlight, and is expected to be a temperature suitable for liquid water to exist on the surface, if it has an atmosphere. 1 2 3 4 5 6 7 8 9 10 11 12 13 14 15 16 17 Anglada-Escudé, G.; Amado, P. J.; Barnes, J.; Berdiñas, Z. M.; Butler, R. P.; Coleman, G. A. L.; de la Cueva, I.; Dreizler, S.; Endl, M.; Giesers, B.; Jeffers, S. V.; Jenkins, J. S.; Jones, H. R. A.; Kiraga, M.; Kürster, M.; López-González, M. J.; Marvin, C. J.; Morales, N.; Morin, J.; Nelson, R. P.; Ortiz, J. L.; Ofir, A.; Paardekooper, S.-J. ; Reiners, A.; Rodríguez, E.; Rodrίguez-López, C.; Sarmiento, L. F.; Strachan, J. P.; Tsapras, Y.; Tuomi, M.; Zechmeister, M. (25 August 2016). "A terrestrial planet candidate in a temperate orbit around Proxima Centauri" (PDF). Nature. 536 (7617): 437–440. arXiv: 1609.03449 . Bibcode:2016Natur.536..437A. doi:10.1038/nature19106. ISSN 0028-0836. PMID 27558064. 1 2 Bixel, A.; Apai, D. (21 February 2017). "Probabilistic Constraints on the Mass and Composition of Proxima b". The Astrophysical Journal Letters. 836 (2): L31. Bibcode:2017ApJ...836L..31W. doi:10.3847/2041-8213/aa5f51. ISSN 2041-8205. ↑ "Earth-like planet discovered orbiting sun's neighbor". CNN. 24 August 2016. Retrieved 24 August 2016. A planet named Proxima b has been discovered orbiting the closest star to our sun. ↑ Davis, Nicola (24 August 2016). "Discovery of potentially Earth-like planet Proxima b raises hopes for life". The Guardian . Retrieved 24 August 2016. 1 2 3 4 Chang, Kenneth (24 August 2016). "One Star Over, a Planet That Might Be Another Earth". New York Times . Retrieved 24 August 2016. 1 2 3 Strickland, Ashley (24 August 2016). "Closest potentially habitable planet to our solar system found". CNN Health. Retrieved 25 August 2016. 1 2 3 4 Clery, Daniel (26 August 2016). "The exoplanet next door". Science News. Retrieved 28 August 2016. Researchers have already found hundreds of similarly sized planets, and many appear to be far better candidates for hosting life than the one around Proxima Centauri, called Proxima b. 1 2 Amos, Jonathan (24 August 2016). "Neighbouring star Proxima Centauri has Earth-sized planet". BBC News. Retrieved 25 August 2016. Just how "habitable" this particular planet really is, one has to say is pure speculation for the time being. 1 2 3 4 Ribas, Ignasi; Bolmont, Emeline; Selsis, Franck; et al. (25 August 2016). "The habitability of Proxima Centauri b: I. Irradiation, rotation and volatile inventory from formation to the present". Astronomy & Astrophysics. 596: A111. arXiv: 1608.06813 . Bibcode:2016A&A...596A.111R. doi:10.1051/0004-6361/201629576. ↑ Marchis, Franck (24 August 2016). "Proxima Centauri b: Have we just found Earth's cousin right on our doorstep?". The Planetary Society . Retrieved 24 August 2016. ↑ Ségransan, D.; Kervella, P.; Forveille, T.; Queloz, D. (2003). "First radius measurements of very low mass stars with the VLTI". Astronomy and Astrophysics. 397 (3): L5–L8. arXiv: astro-ph/0211647 . Bibcode:2003A&A...397L...5S. doi:10.1051/0004-6361:20021714. 1 2 Mathewson, Samantha (24 August 2016). "Proxima b By the Numbers: Possibly Earth-Like World at the Next Star Over". Space.com. Retrieved 25 August 2016. ↑ Fraser Cain (16 September 2008). "How Old is the Sun?". Universe Today. Retrieved 19 February 2011. ↑ Fraser Cain (15 September 2008). "Temperature of the Sun". Universe Today. Retrieved 19 February 2011. 1 2 3 "Proxima b is our neighbor ... better get used to it!". Pale Red Dot. 24 August 2016. Retrieved 24 August 2016. ↑ Schlaufman, K. C.; Laughlin, G. (September 2010). "A physically-motivated photometric calibration of M dwarf metallicity". Astronomy and Astrophysics. 519: A105. arXiv: 1006.2850 . Bibcode:2010A&A...519A.105S. doi:10.1051/0004-6361/201015016. ↑ Jao, Wei-Chun; Henry, Todd J.; Subasavage, John P.; Winters, Jennifer G.; Gies, Douglas R.; Riedel, Adric R.; Ianna, Philip A. (2014). "The Solar Neighborhood. XXXI. Discovery of an Unusual Red+White Dwarf Binary at ~25 pc via Astrometry and UV Imaging". The Astronomical Journal. 147 (1): 21. arXiv: 1310.4746 . Bibcode:2014AJ....147...21J. doi:10.1088/0004-6256/147/1/21. ISSN 0004-6256. ↑ Christian, D. J.; Mathioudakis, M.; Bloomfield, D. S.; Dupuis, J.; Keenan, F. P. (2004). "A Detailed Study of Opacity in the Upper Atmosphere of Proxima Centauri" (PDF). The Astrophysical Journal. 612 (2): 1140–1146. Bibcode:2004ApJ...612.1140C. doi:10.1086/422803. ↑ Williams, Matt (2018-04-10). "Proxima Centauri Just Released a Flare so Powerful it was Visible to the Unaided Eye. Planets There Would Get Scorched". Universe Today. Retrieved 2019-01-17. ↑ Ritchie, Raymond J.; Larkum, Anthony W. D.; Ribas, Ignasi (April 2018). "Could photosynthesis function on Proxima Centauri b?". International Journal of Astrobiology . 17 (2): 147–176. Bibcode:2018IJAsB..17..147R. doi:10.1017/S1473550417000167 . Retrieved 2018-09-10. ↑ Schlyter, Paul (2017-03-05). "Radiometry and photometry in astronomy". stjarnhimlen.se. Stockholm, Sweden. 10: How bright are natural light sources?. Retrieved 2017-06-21. ↑ Howard, Ward S; Tilley, Matt A; Corbett, Hank; Youngblood, Allison; Parke Loyd, R. O; Ratzloff, Jeffrey K; Fors, Octavi; Daniel del Ser; Shkolnik, Evgenya L; Ziegler, Carl; Goeke, Erin E; Pietraallo, Aaron D; Haislip, Joshua; Law, Nicholas M (2018). "The First Naked-Eye Superflare Detected from Proxima Centauri". arXiv: 1804.02001 . ↑ Garraffo, Cecilia; Drake, Jeremy J.; Cohen, Ofer (28 September 2016). "The Space Weather of Proxima Centauri b". The Astrophysical Journal. 833: L4. arXiv: 1609.09076 . Bibcode:2016ApJ...833L...4G. doi:10.3847/2041-8205/833/1/L4. ↑ O'Neill, Ian (7 October 2016). "Eyeballing Proxima b: Probably Not a Second Earth". Discovery News. Space.com. Retrieved 2016-10-10. 1 2 Witze, Alexandra (24 August 2016). "Earth-sized planet around nearby star is astronomy dream come true". Nature. pp. 381–382. Bibcode:2016Natur.536..381W. doi:10.1038/nature.2016.20445 . Retrieved 24 August 2016. 1 2 Singal, Ashok K. (2014). "Life on a tidally-locked planet". Planex Newsletter. 4 (2): 8. arXiv: 1405.1025 . Bibcode:2014arXiv1405.1025S. ↑ Heller, R.; Leconte, J.; Barnes, R. (April 2011). "Tidal obliquity evolution of potentially habitable planets". Astronomy & Astrophysics. 528: 16. arXiv: 1101.2156 . Bibcode:2011A&A...528A..27H. doi:10.1051/0004-6361/201015809. A27. ↑ Makarov, Valeri V. (June 2012), "Conditions of Passage and Entrapment of Terrestrial Planets in Spin-orbit Resonances", The Astrophysical Journal, 752 (1): 8, arXiv: 1110.2658 , Bibcode:2012ApJ...752...73M, doi:10.1088/0004-637X/752/1/73, 73. 1 2 3 4 The habitability of Proxima Centauri b – II. Possible climates and observability. Retrieved 25 August 2016. ↑ "Numerical simulation of possible surface temperatures on Proxima b (synchronous rotation)". ESO. 2016. Retrieved 24 August 2016. ↑ Barnes, Rory (24 August 2016). "The Habitability of Proxima Centauri b I: Evolutionary Scenarios". Astrobiology. 1608: 62. arXiv: 1608.06919 . Bibcode:2016arXiv160806919B. ↑ "Follow a Live Planet Hunt!". European Southern Observatory. 15 January 2016. Retrieved 24 August 2016. ↑ Feltman, Rachel (24 August 2016). "Scientists say they've found a planet orbiting Proxima Centauri, our closest neighbor". The Washington Post– via GALE. ↑ "Planet Found in Habitable Zone Around Nearest Star – Pale Red Dot campaign reveals Earth-mass world in orbit around Proxima Centauri". www.eso.org. Retrieved 10 January 2017. ↑ "Found! Potentially Earth-Like Planet at Proxima Centauri Is Closest Ever". Space.com. 24 August 2016. ↑ Knapton, Sarah (24 August 2016). "Proxima b: Alien life could exist on 'second Earth' found orbiting our nearest star in Alpha Centauri system". The Telegraph . Telegraph Media Group . Retrieved 24 August 2016. 1 2 "VLT to Search for Planets in Alpha Centauri System - ESO Signs Agreement with Breakthrough Initiatives". www.eso.org. Retrieved 10 January 2017. ↑ Lovis, C.; Snellen, I.; Mouillet, D.; Pepe, F.; Wildi, F.; Astudillo-Defru, N.; Beuzit, J. -L.; Bonfils, X.; Cheetham, A.; Conod, U.; Delfosse, X.; Ehrenreich, D.; Figueira, P.; Forveille, T.; Martins, J. H. C.; Quanz, S.; Santos, N. C.; Schmid, H. -M.; Ségransan, D.; Udry, S. (2016). "Atmospheric characterization of Proxima b by coupling the SPHERE high-contrast imager to the ESPRESSO spectrograph". Astronomy & Astrophysics. 599: A16. arXiv: 1609.03082 . Bibcode:2017A&A...599A..16L. doi:10.1051/0004-6361/201629682. ↑ Kreidberg, Laura; Loeb, Abraham (2016). "Prospects for Characterizing the Atmosphere of Proxima Centauri b". The Astrophysical Journal. 832: L12. arXiv: 1608.07345 . Bibcode:2016ApJ...832L..12K. doi:10.3847/2041-8205/832/1/L12. ↑ Kipping, David M.; et al. (2017). "No Conclusive Evidence for Transits of Proxima b in MOST photometry". The Astronomical Journal. 153 (3): 93. arXiv: 1609.08718 . Bibcode:2017AJ....153...93K. doi:10.3847/1538-3881/153/3/93. ↑ Staff (12 April 2016). "Starshot". Breakthrough Initiatives . Retrieved 12 April 2016. ↑ Gilster, Paul (12 April 2016). "Breakthrough Starshot: Mission to Alpha Centauri". Centauri Dreams. Retrieved 14 April 2016. ↑ Overbye, Dennis (12 April 2016). "Reaching for the Stars, Across 4.37 Light-Years; A Visionary Project Aims for Alpha Centauri, a Star 4.37 Light-Years Away". New York Times . Retrieved 12 April 2016. ↑ Stone, Maddie (12 April 2016). "Stephen Hawking and a Russian Billionaire Want to Build an Interstellar Starship". Gizmodo. Retrieved 12 April 2016. Wikimedia Commons has media related to Proxima Centauri b . "ESOcast 87: Pale Red Dot Results" – via YouTube. "Interviews with Pale Red Dot scientists" – via YouTube. "Press Conference at ESO HQ" – via YouTube.